The full truckload shipping industry has been around for decades, but it only just started embracing new technology to make the logistics easier and more efficient. Loadsmart uses automation to rethink every facet of the shipping business to introduce transparency and convenience. Using this platform, it takes only a few seconds to receive an estimate for the cost of hire based on a few factors include the load, time of loading, and commodity involved. The platform also features the ability to track shipment location in real-time and an app that allows for one-click load booking for carriers. 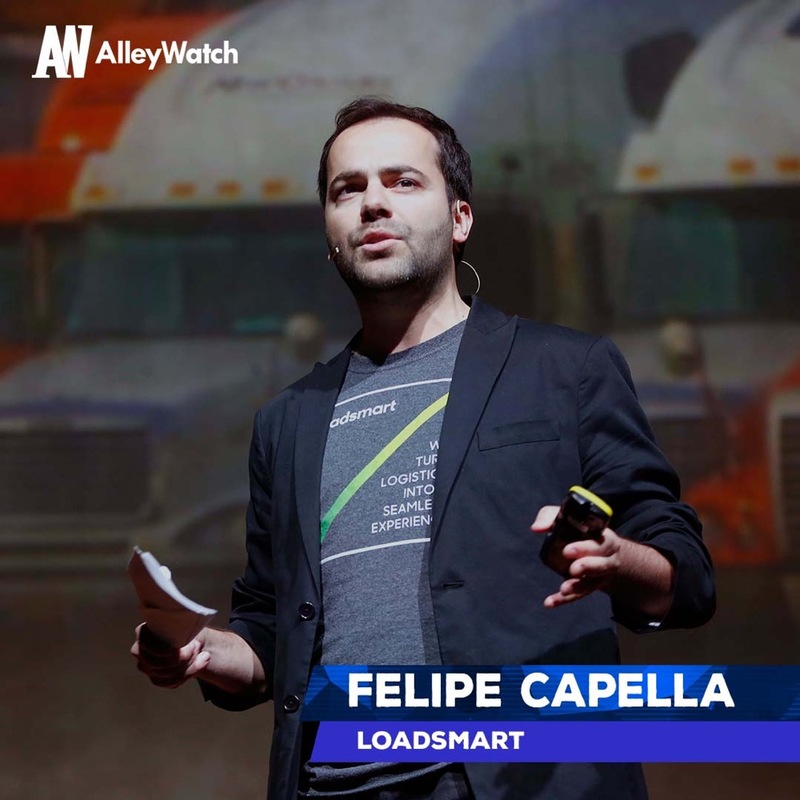 AlleyWatch spoke with cofounder Felipe Capella about innovating this shipping industry and Loadsmart’s recent funding round, which brings the total funding amount to $34.7M across three rounds. Series A: $21.6M. 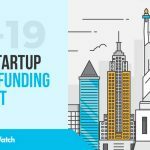 Investors include Maersk Growth, Connor Capital SB, Chromo Invest, and a strategic partnership with Oaktree Capital. Tell us about the product or service that Loadsmart offers. Loadsmart is a technology company that specializes in full truckload shipping. Its online platform helps shippers move freight fast and carriers keep trucks full. Headquartered in New York, we leverage automation into the complex freight brokerage cycle to bring technology, design, and analytics to every single aspect of the business: from the sales process, instant quoting and booking, to intelligent sourcing of carries. Since inception, we have been obsessed with introducing new technology to dramatically improve the efficiency of the freight brokerage business. This effort includes creating a better experience for shippers and carriers as well as improving and automating back-office processes. By analyzing data from various data sources, in a matter of seconds, we zero in on the estimate for the cost of hire based on the load, time of loading, commodity involved, and the lane it gets hauled in. This approach enables us to guarantee capacity to the shippers instantaneously with the estimated cost for delivery, even before it confirms a truck to haul the capacity. We gather data from every single one of the 272K carriers running on U.S. roads and use the data in its matching algorithm to find the best possible match for its shipping clients. Our API allows us to onboard a carrier in three minutes and provide instant price quotes to shippers. The Loadsmart pricing algorithm delivers an instantly bookable rate in seconds. Through our integration with transportation management systems (TMS), it can be booked with one click from within the shipper’s chosen TMS, removing the need to call or email to confirm the rate. Loadsmart doesn’t give loads back and won’t change the rate after booking, even if they end up having to pay more to move the load. 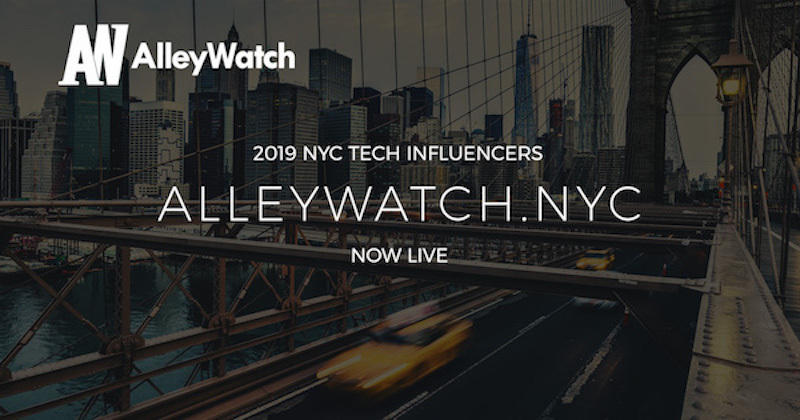 Our matching algorithm leverages a database of curated carriers, which we have built over the last four years based on strict compliance standards. At the same time, our platform helps carriers to find shipments based on their location and preferences and keeps their fleet running. What inspired you to start Loadsmart? For our CEO Ricardo Salgado, his insight into the logistics industry started young. Salgado’s parents owned a paper company and were frequently met with frustrations as a result of poor logistics management. He learned more about the industry after graduating college, often working directly with logistics companies as an investment manager for Goldman Sachs. The idea for Loadsmart was to create a different – and much more efficient – experience for shippers to book loads with carriers. Ideally, the experience would be as easy as buying an airline ticket or a booking ride across town. It wasn’t about introducing incremental changes but using transformative technology to automate processes. When Loadsmart launched, only about 25% of the drivers had smartphones. I saw this as an opportunity to bring technology and automation into this cycle. At Loadsmart we lead with technology and compliment it with strategic partnerships to do more with less. Traditional load boards are still time-consuming and collect information from carriers and shippers but don’t support true collaboration. Brokers, on the other hand, rely heavily on phone and email to move freight. We have been the pioneer on mobile solutions for freight brokerage operations since inception: from driver apps that track shipment location to apps offering one-click load booking for carriers. Just recently, we introduced an instant pricing API for transportation management system integrations – the first company in our industry to do so. This last functionality enables shippers to automatically book a truck before the shipment turns into a spot, load, and as a result, reduced spot volume for Fortune 500 shippers by as much as 50 percent. Loadsmart accepts 100 percent of tenders received from the dynamic routing guide, guaranteeing capacity. This feature helps shippers avoid the same-day/next-day markets, which are known for steep prices and service failures. Last but not least, what sets us apart is our DNA; our people. It’s our curiosity to question the status quo, and leverage technology and data, which makes us successful. What market does Loadsmart target and how big is it? The full truckload for hire is a $337B industry, which lacks technology. Only 18 percent of truck companies have fleet management solutions and rely heavily on manual work. Due to the lack of limited to no automated/digital processes, sourcing trucks still involves phone lists. Freight location is mostly tracked via phone calls. Moreover, it is a very fragmented market of which the biggest broker only has two percent of the market share and 90 percent of motor carriers have six or fewer trucks. Even a small market share penetration yields a huge company value and once the network effects kick-in Loadsmart could control over 10 percent of the market. We are changing the business model of the industry. 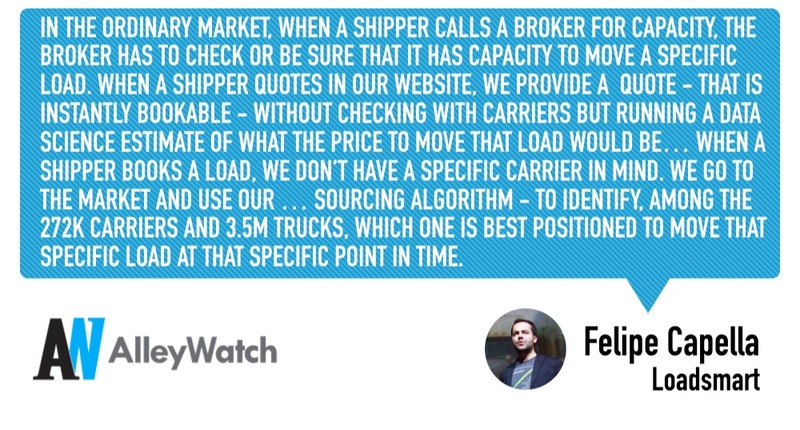 In the ordinary market, when a shipper calls a broker for capacity, the broker has to check or be sure that it has capacity to move a specific load. When a shipper quotes in our website, we provide a quote – that is instantly bookable – without checking with carriers but running a data science estimate of what the price to move that load would be. That means that when a shipper books a load with Loadsmart, we don’t have a specific carrier in mind. We go to the market and use our second most important algorithms – sourcing algorithm – to identify, among the 272,000 carriers and 3.5M trucks, which one is best positioned to move that specific load at that specific point in time. This technology allows us to provide a price in one second. For example, we have customers that move 500 loads per day, so we price every day every load via electronic system, with no human involvement. Surprisingly quick and a little out of the blue. Our team has spent the past couple of years focused on perfecting the data and algorithms that power the Loadsmart platform. This meant finding the right data sources, sometimes through partnerships, and then building sophisticated models that could automate key parts of the business, such as generating rates, sourcing carriers, and managing loads. In short, using our data to move more with less. We didn’t really do any PR and only just hired our first marketer a month ago. So, it was a little surprised when we were first approached over the summer. It was even more surprising when we closed a $22M round just a couple of months later. Things don’t usually happy that fast. But for us the timing made total sense. Our revenues had tripled YoY, which seemed like a pretty big signal that we had found product/market fit, and the capital + partnerships offered by this latest round meant we could accelerate that growth by further investing in our engineering team and scaling our sales and marketing functions. We’re incredibly lucky to have such great partners in Maersk, Connor Capital, Chromo Invest and Oaktree. Finding the right partner is difficult. Early on we struggled with whether strategic investors or VCs would ultimately provide the most value to our mission. As we began to flesh out what relationships with Maersk and Oaktree could look like, it became clear that strategic partnerships would position us uniquely in the market, giving us access to resources that we simply otherwise wouldn’t have access to if we went the traditional VC route. Every company/industry is different, but for Loadsmart, going the strategic route made the most sense. Would you tell us about the decision to pursue strategic funding rather than going the traditional venture route? Strategic partnerships with firms like Maersk Growth, Connor Capital SB, Chromo Invest, and Oaktree Capital enable us to dramatically accelerate our mission to move more with less. This occurs across a few different dimensions. Maersk and Oaktree respectively represent the largest overseas cargo carrier in the world and the largest terminal operator in the United States. Learnings gleaned from these relationships will help us more accurately forecast capacity, and in turn, offer better rates to our customers across a wider selection of the lanes (origin and destinations) they operate in. Further, as shipments move from ocean to port, and eventually onto a truck, these partnerships enable us to deliver a better, more seamless experience for our shared customers. For us, these relationships offered significant advantages beyond the typical venture route. At our core, we are a data company. This tech-first approach allowed us to set in place a fully scalable and automated distribution model. With this model, investors were able to see the value of the company and its promise for the future. Though not all investors may be familiar with the logistics industry, many are interested in emerging tech and how it can apply to large markets such as this one. “We see huge potential with Loadsmart. Forward integrations between ocean shipping and over-the-road services can create incredible synergies and eventually provide a full service to shippers,” said Sune Stilling, head of Maersk Growth. We are focusing on onboarding several Fortune 500 companies – so we will be busy building integrations with these enterprise shippers to scale up. 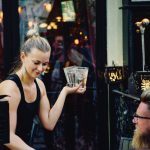 The latest round of investment will enable us to increase the business exponentially while maintaining high service levels. It will also enable us to scale without losing the edge on innovation and technology. Unscalable can be OK. Really. In an early stage startup, the reality is that you will have to do stuff that simply won’t scale as the company matures. Sometimes that’s scary for founders. There’s a time and a place for everything. As a founder, don’t let yourself get too overwhelmed by trying to figure out how a process scales down the road once you have capital. This is especially true in acquiring those first few early customers. Leverage your relationships and don’t be afraid to ASK. You’ll be surprised how far you can get by leveraging your network and ASKING for help – whether that’s an introduction, a pilot, feedback, or something else. People genuinely want to be helpful, you just need to ask. Further, vendors are often willing to negotiate terms pre-capital by reducing and/or deferring costs. Focus on making existing customers successful. Sometimes it’s a little scary to ask your anchor customers to expand the relationship, but if you’ve kept them happy and delivered value, it’s an entirely fair ask. You’d be surprised – more often than not, if you’ve kept those key accounts happy, they’ll be willing to deepen their relationship with you. In the near term, we’re really focused on leveraging these new partnerships to better fulfill our mission: moving more with less. That means expanding our engineering and data science teams, scaling sales + marketing, and creating deeper relationships with our customers through new products and services, as well as better integrating into their current tech stack. To put some numbers around that, by the end of 2019 we’ll have doubled headcount across our offices. Depending on the night, you’ll might find us at Toad Hall or Bar Hugo.